I want to add JTable into JPanel whose layout is null. JPanel contains other components. I have to add JTable at proper position. 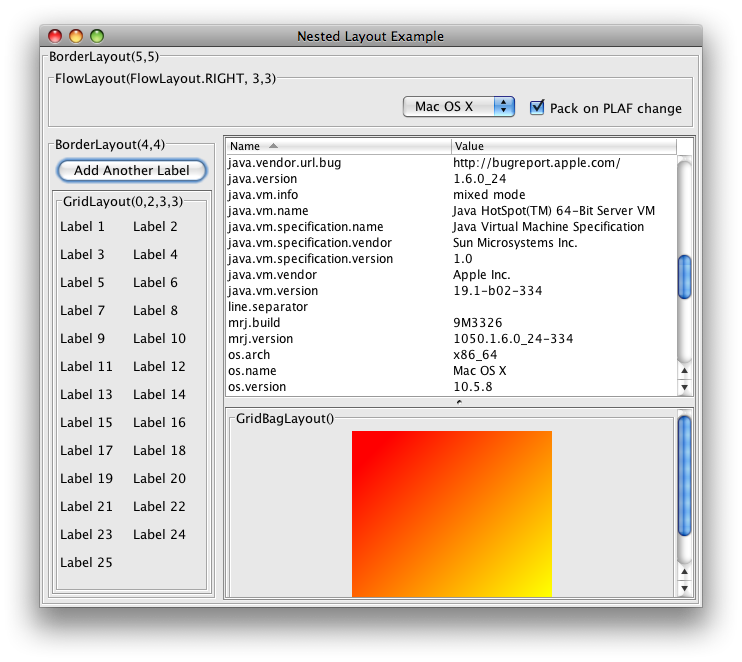 The Java Tutorial has comprehensive information on using layout managers. See the Laying Out Components Within a Container lesson for further details. One aspect of layouts that is not covered well by the tutorial is that of nested layouts, putting one layout inside another to get complex effects. The following code puts a variety of components into a frame to demonstrate how to use nested layouts. All the layouts that are explicitly set are shown as a titled-border for the panel on which they are used. There is a combo-box to change PLAF (Pluggable Look and Feel) at run-time. The GUI is expandable to the user's need. The image in the bottom of the split-pane is centered in the scroll-pane. The label instances on the left are dynamically added using the button. 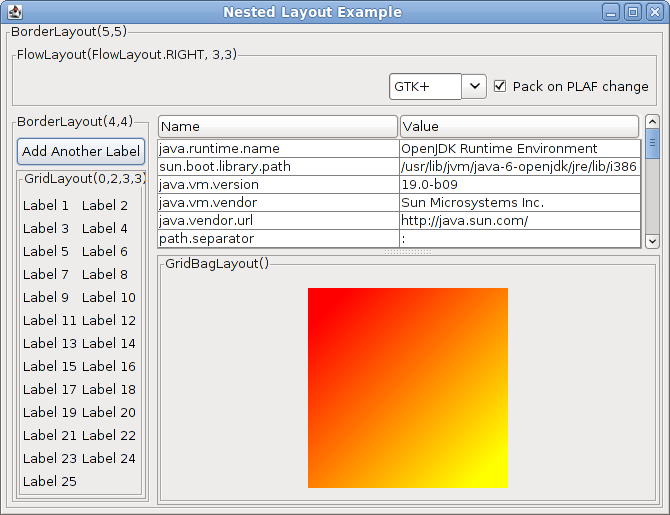 /** A short example of a nested layout that can change PLAF at runtime. 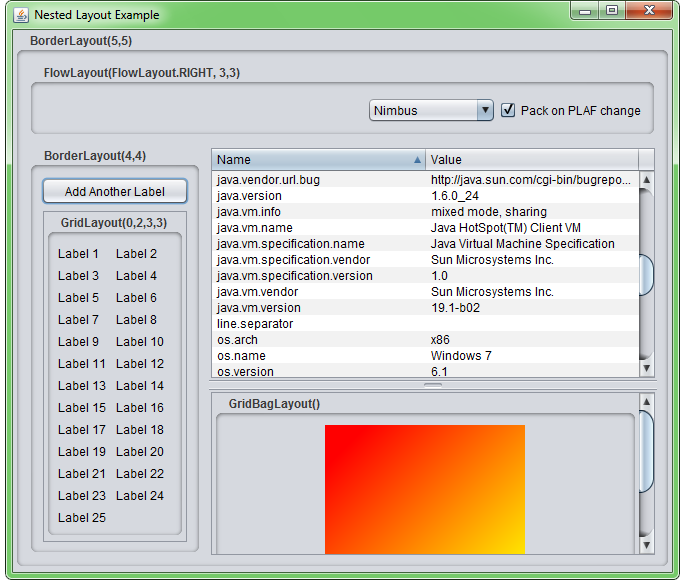 The TitledBorder of each JPanel shows the layouts explicitly set. LayoutManagers allow you to properly handle things window resizing or dynamic component counts. They might seem intimidating at first, but they are worth the effort to learn. If you are using null layout manager you always need to set the bounds of a component. That is the problem in your case. You should do what everyone suggest here and go and use some layout manager believe they save time. Go and check out the tutorial in @jzd's post. 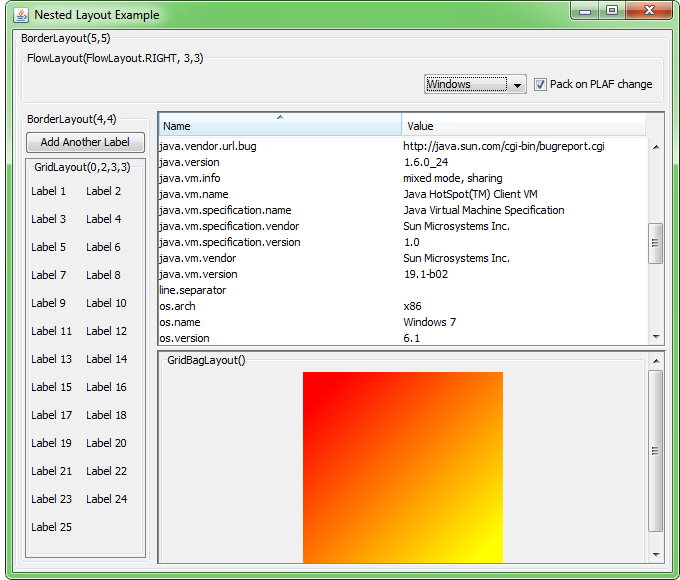 JTable should be added into the JScrollPane which actually should be added into the JPanel. The JPanel should have some layout manager. If you don't care about the precision of components size you can use pure BorderLayout and combine it with FlowLayout and GridLayout. if you need precision - use jgoodies FormLayout. The FormLayout is really tricky one, but you can play a little with WindowBuilder (which is embedded into Eclipse) and a look at the code it generates. It may look complicated but it is just an ignorance. First, you should seriously consider other Layout managers, for example the BorderLayoutManager (new JPanel(new BorderLayout())) is a good start. Also when designing your dialog, remember that you can and should nest your layouts: one JPanel inside another JPanel (e.g. a GridLayout inside a BorderLayout). Please note: a 'good' dialog should resize properly, so that if the user resizes your Frame, you want to automatically extend your information objects such as your table, and not show large areas of JPanel background. That's something you cannot achieve with a NullLayout. When a component have a "null" layout, you have to manage the layout by yourself, that means you have to calculate the dimensions and locations for the children of the component to decide where they are drawn. Quite tedious unless it is absolutely necessary. If you really want that fine-grained control, maybe try GridBagLayout first before going mudding with the UI arrangement. You can make use of the following code. To add JTable to JPanel. Not the answer you're looking for? Browse other questions tagged java layout jtable layout-manager null-layout-manager or ask your own question. Hello,How can i add two panels in one frame? Cant get JTable to appear on GUI.. what am I missing? The Use of Multiple JFrames: Good or Bad Practice? How to make Java look like Windows programs?